Moroccan Mallow Salad (Khoubiza or Bakoula). Common mallow (khoubiza or bakoula) grows wild in Morocco, and it's not unusual to see people gathering the leaves from fields, empty lots or wherever else they might find them. They're also sold in large bunches in souks. The leaves are chopped, steamed and then sauteed with olive oil, spices, olives, and preserved lemons. The resulting cooked salad is eaten as a dip with Moroccan bread. For a fiery touch, add a roasted and minced chili pepper or a small spoonful of harissa. 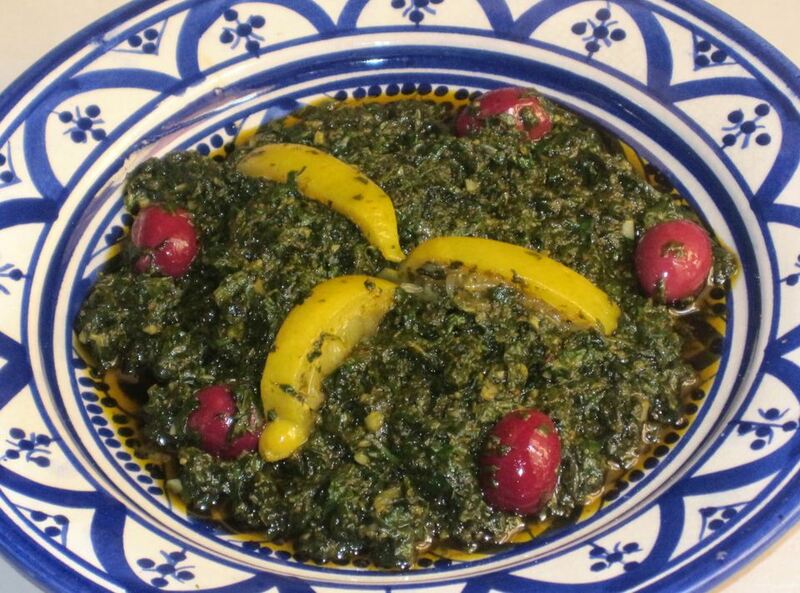 The preparation is the same as for Moroccan Spinach Salad with Preserved Lemons and Olives. In lieu of mallow or spinach, you may want to try the same method with other greens; cookbook author Paula Wolfert recommends a mix of Swiss chard, purslane, arugula, and beet greens. Wash the mallow very well several times in a large bowl of water. Drain thoroughly. Finely chop the leaves, place them in a steamer, and steam over simmering water for 15 to 20 minutes, until the leaves darken and are tender. Squeeze out any excess liquid from the steamed mallow, and transfer the mallow to a skillet. Add the remaining ingredients (except for the olives), stir to mix, and saute over medium heat for 5 to 10 minutes until the parsley is wilted and the flavors have blended. Adjust seasoning if desired. Serve warm or at room temperature, garnishing the salad with the olives and preserved lemon rinds.